Much less common than the related species Grifola frondosa, which is known as Hen of the Woods, the fruitbodies of the Umbrella Polypore Polyporus umbellatus are fairly short-lived; they occur as fungal rosettes at the bases or on large underground roots of deciduous hardwood trees, and most often on oaks. This fungus is parasitic and attacks living trees, causing a white rot. Trees can live for several years with this fungal infection, and so fruitbodies may recur for a number of seasons. 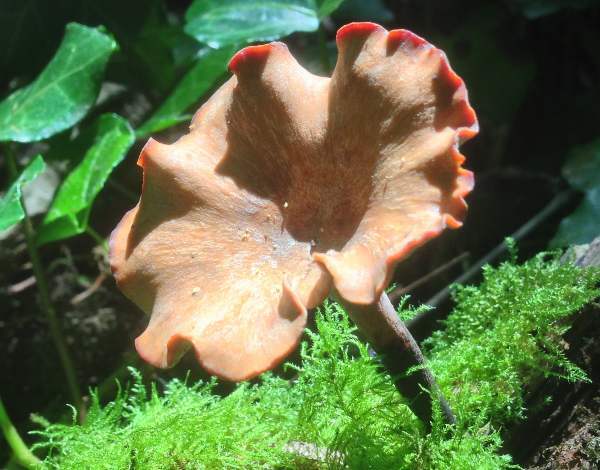 The Umbrella Polypores shown above was found in Bedfordshire, England; the darker specimen pictured below was growing at the base of an old oak tree in the New Forest, Hampshire, England. 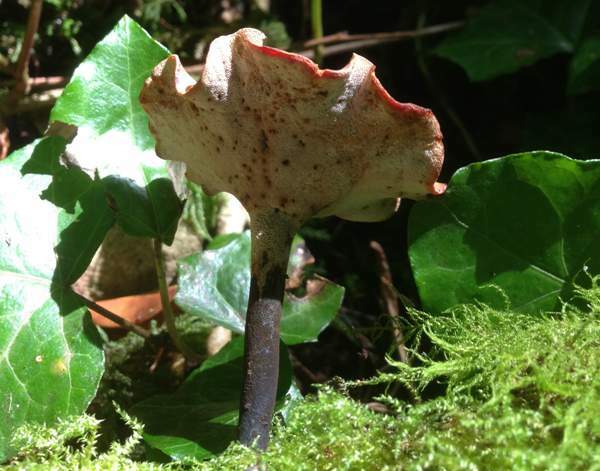 Fairly common and widespread in Britain, this distinctive polypore also occurs in most mainland European countries and is recorded from other parts of the world including North America. The basionym of this species dates from 1778, when Dutch naturalist Nicolaus Joseph von Jacquin (1727 - 1817) described this polypore and gave it the binomial scientific name Boletus leptocephalus. It was Swedish mycologist Elias Magus Fries who, in 1821, transferred this species to the genus Polyporus, thereby establising its currently-accepted scientific name. Synonyms of Polyporus leptocephalus include Boletus leptocephalus Jacq., Boletus elegans Bull., Boletus nummularius Bull., Coltricia leptocephala (Jacq.) Gray, Boletus varius Pers., Grifola varia (Pers.) Gray, Polyporus nummularius (Bull.) Pers., and Polyporus elegans (Bull.) Trog. Polyporus, the genus name, comes from poly, meaning many, and poros, meaning passage - in this instance the tubular holes known as pores on the fertile (spore-producing) underside of the cap and within which spores develop. 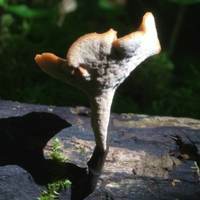 The specific epithet leptocephalus comes from the Greek adjective lept- meaning slim or slender, and -kephale meaning a head - hence by implication this polypore has a slim head or cap. Fruitbody comprises a slender stem and a thin-fleshed cap connected either centrally, eccentrically or occasionally laterally to the stem. Caps are generally 2 - 6cm but can grow to 10cm in diameter and often develop scalloped margins. The radially fibrous upper surface is yellowish brown, and beneath the cuticle the thin flesh is white. The fertile undersurface of the cap comprises shallow tubes typically 1 - 3mm deep and usually rounded; they terminate in pale cream pores spaced at 4 to 6 per mm which are decurrent to the stem. 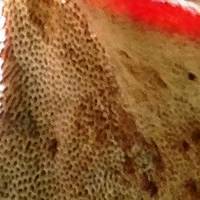 The pores turn ochre when old or if bruised. Stems of this polypore are whiish, turning ochre wit age. The lower part of the stem is nearly always black - a useful distinguishing feature..
Cylindrical or slightly allantoid, smooth, 8-11 x 3-4μm; inamyloid. Saprophytic, usually on timber from beech trees but occasionally on other hardwoods. Annual; late spring, summer and autumn, but in dryish locations these tough polypores often persist throughout the year. Polyporus ciliatus is similar but does not have a black stem base. Polyporus brumalis is similar but has larger pores and does not have a black stem base. Polyporus durus had a red-brown cap and generally has larger caps.